The Ultra Bench Top Flex Shaft Woodcarver features a 1/2 horsepower, 30,000 RPM Motor (2 Year Warranty) that includes reversing. The rugged base has a built-in variable speed dial control for full power and precise speed adjustment from 0-30,000 RPM. This base has non-slip rubber feet, and is pre-drilled for wall or bench mounting. 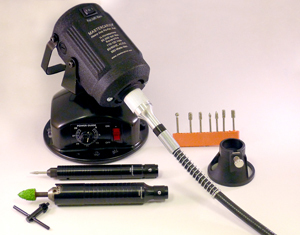 Included in the Ultra Bench Top set are: 1/2hp reversing motor with hanger, Flex-Shaft and Bench Top Base with variable speed control, Stealth Rotary Handpiece (patent pending) featuring a key chuck that will accept accessories with shanks up to a max. of 1/4" diameter. Detail Pro Handpiece that is 1/2" diameter for great control (includes collets to accept 1/16", 3/32", 1/8" shanks), Handpiece Router Guide secures handpiece for routing inlays and for piercing turnings, 9 Diamond Point Burrs.